Hello! Temperatures continue to stay in 90's here in Richmond so to stay cool I slipped on this olive green romper. To keep my curls out of my face, I tied on a vintage scarf around my head. My feet were decked out in my white Urban Outfitters boots. 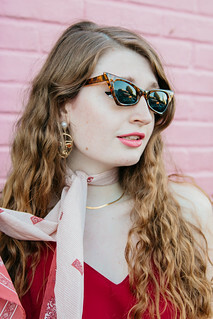 I accessorized with vintage Chanel earrings and Giant Vintage Sunglasses. In these photos, you can also see my new iPhone case. Wanderlustiny recently sent me several items to review including this iPhone case and countless temporary tattoos (more on that in the next paragraph). 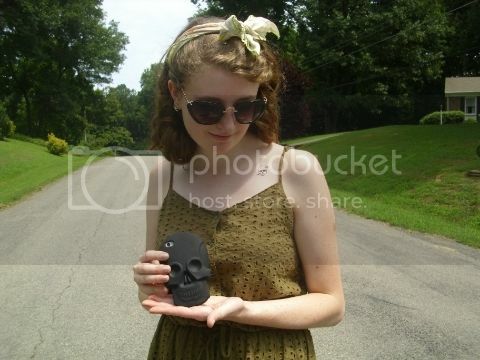 What I love the most about this iPhone case is that it is in the shape of a skull. How awesome is that? The design is very unique and I feel very fortunate to have this case. I am also very impressed with the quality of this case. Another thing that I love about this case is that there is easy access to all buttons and features. No need to take off the case if I want to charge my phone or listen to music with headphones. Unlike other phone cases of the same quality/ style, this case is very affordable. You can find this case HERE for $8.99. They sell it in both pink and black for both the iPhone 4 and the iPhone 5. While on their site, I would also definitely check out their other iPhone cases. They are all so adorable! In particular, the Retro Cassette case and Airmail case are super cute. And now onto the review of the temporary tattoos that Wanderlustiny sent me. I can describe them in just one word: perfect. If you've been following my blog for a while then you would know that one of the things on my summer bucket list was to experiment with temporary tattoos. Well, I can cross that off! Wanderlustiny sent me the Grunge Style Tattoos ($6.99) and the Eye Tattoos ($1.59). In the photos above, I am wearing a skull tattoo from the grunge set. It was very easy to apply. As for how well it has held up, it is holding up pretty well but I only put it on today. I will let you know how it holds up over the next few days. If you are looking for inexpensive temporary tattoos, I would definitely check Wanderlustiny out. 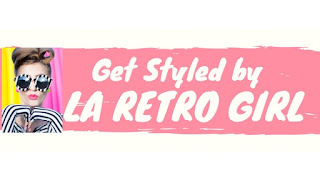 Not only do they have grunge style temporary tattoos but also hipster and retro temporary tattoos. Wanderlustiny also sells bracelets, earrings, rings, necklaces and hair accessories. You can check them out HERE. P.S. Don't forget to enter my giveaway for a purple scissors scarf courtesy of Snoozer Loser HERE! You are adorable! the shoes are gorgeous, and the case is amazing! Love your cute romper and the rad i-phone case. I can't get enough of skulls. I want, no need, more olive green in my wardrobe! 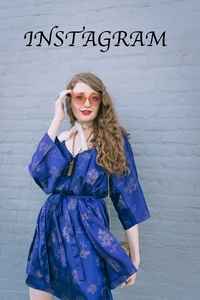 Such an adorable romper!